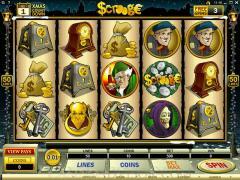 Scrooge is a Microgaming slot game based on the Charles Dickens novel "A Christmas Carol". It is thus connected to the spirit of Christmas. All the major characters from the novel appear as symbols on the reels. They include the tightwad Ebenezer Scrooge, the ghost of his deceased business partner Jacob Marley, the physically challenged Tiny Tim and the ghosts of Christmas Past, Present, and Future. The Scrooge Logo is the wild symbol and the Door Knocker is the scatter symbol. Other symbols are Safe, Moneybag, Ledger, Clock and Keys. The betting options provide a wide range. There are 50 paylines in the slot game, which make for more frequent payouts. The coin size varies from 0.01 to 0.50 and the number of coins varies from 1 to 10. The maximum total bet per spin is 250.00, which makes it attractive to high rollers. 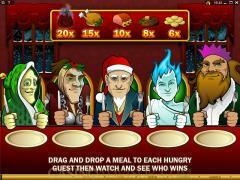 Three or more scatter symbols offer scatter payouts and trigger the bonus game on the second screen, which is the Xmas Dinner bonus. When three or more Door Knocker symbols appear on the screen the door opens to reveal first Scrooge and then the ghosts of Marley and the three Christmases. 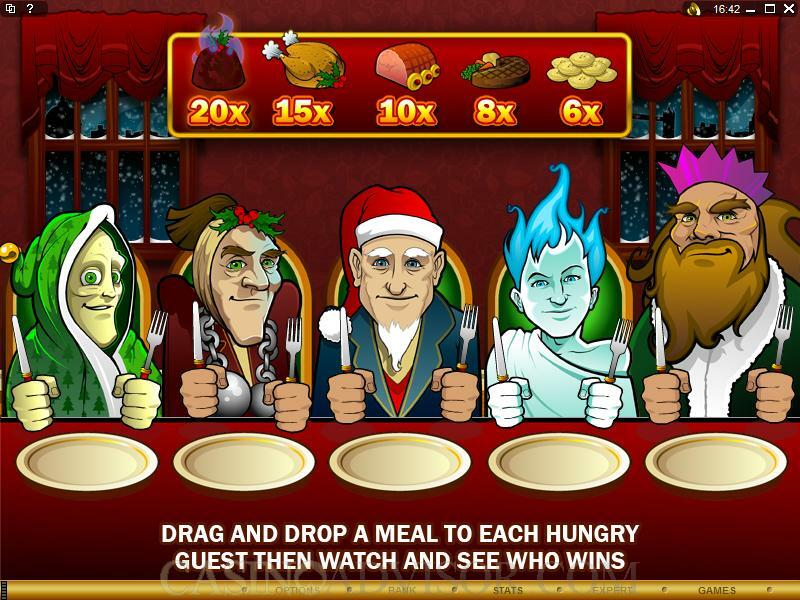 In the second screen the five of them are seated at the dinner table with five Christmas dishes in a row above them. The player drags and drops one dish in the plate of each person. In the game one character stays lighted up and the payout is the triggering bet times the multiplier corresponding to the dish that character is eating. The maximum payout in this feature is 10,000 coins. The Free Spins Feature is triggered in an innovative manner. Whenever there is a winning combination the player has to choose any of the symbols from the combination. The chosen symbol randomly adds one future free spin to the counter or adds one day to the countdown calendar. When the date in the calendar is December 25 the Free Spins Feature is triggered with the number of free spins in the counter. The payouts are doubled during free spins. The Free Spins Feature cannot be re-triggered. The maximum payout in this feature is 120,000 coins with Max Bet. Another Christmas bonanza is received from the wild symbol, which is the Scrooge Logo. It doubles payouts when it helps to make a winning combination. When it does so, the symbol spews gold and sliver coins on the reels. 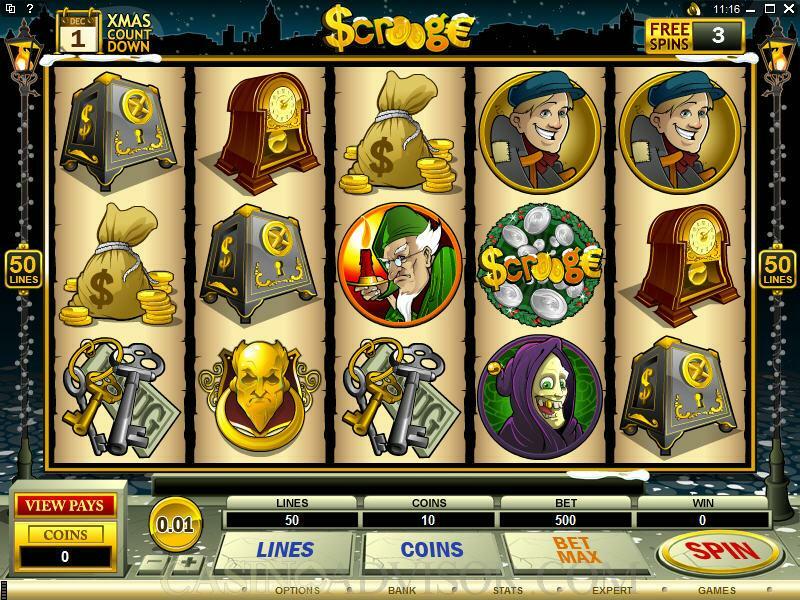 The Scrooge Logo also offers the largest fixed jackpot. Interested in reading more detailed information about Scrooge? If so Click Here for more details.